Durga (pronunciation: [ˈd̪ʊrɡaː]; Sanskrit: दुर्गा; Bangla: দুর্গা), meaning "the inaccessible" or "the invincible", is the most popular incarnation of Devi and one of the main forms of the Goddess Shakti in the Hindu pantheon. Durga is the original manifested form of Mother Parvati or Adi-Parashakti. Durga is Adi-Parashakti herself. The Devi Gita, declares her to be the greatest Goddess. Thus, she is considered the supreme goddess and primary deity in Shaktism, occupying a place similar to Lord Krishna in Vaishnavism. According to Skanda Purana, the goddess Parvati accounted the name "Nanny" after she killed the demon Mahishasura. According to legend, Durga was created for the slaying of the buffalo demon Mahisasura, by Brahma, Vishnu, Shiva, and the lesser gods who were otherwise powerless to overcome him. Embodying their collective energy (shakti),...She is usually depicted riding a Tiger and with 8 or 10 arms, each holding the special weapon of one of the gods, who gave them to her for her battle against the buffalo demon.... - Encyclopedia Britannica. She [Durga] looks gracious always with sweet sweetfull sweet on her lips, her hands are one thousand in number. Various weapons are in all her hands. The clothing's of the three-eyed one are bright and purified by Fire. She is decorated with ornaments all of jewels. All the women who are the jewels are sprung from her parts and parts of parts and by the power of her Mâyâ, all the people of the world are enchanted. She bestows all the wealth that a householder wants to have. According to legend, Durga was created for the slaying of the buffalo demon Mahisasura, by Brahma, Vishnu, Shiva, and the lesser gods who were otherwise powerless to overcome him. Embodying their collective energy (shakti), she is both derivative from the male divinities and the true source of their inner power. She is also greater than any of them. Born fully grown and beautiful, Durga presents a fierce menacing form to her enemies. She is usually depicted riding a lion and with 8 or 10 arms, each holding the special weapon of one of the gods, who gave them to her for her battle against the buffalo demon. The Durga-puja, held annually in her honor, is one of the great festivals of northeastern India. [Durga or Parvati] in Hindu mythology is the wife of Siva and daughter of Himavat (the Himalayas). She has many names and many characters. - **Encyclopedia Britannica. [Durga or Parvati] in Hindu mythology is the wife of Siva and daughter of Himavat (the Himalayas). She has many names and many characters. Encyclopedia Britannica in: 1911 Encyclopædia Britannica/Durga, Wikisource. Purport: Memorize it, chant it out loud when possible, keep it in your head- or write it on a yellow stick-ems and post them on your computer, on your phone, your desk. Any time your boundaries being impinged upon, start chanting it over and over in your mind. Commemoration during the renowned Navaratri celebrations at Mysore, which otherwise strongly emphasizes the Durga legend, as may be expected in the city built at the very site of the events of the Durga legend. 'Iśvara' holds the semantic field: master, lord, prince, king, mistress, queen, a husband, God, the Supreme Being, the supreme soul (आत्मन्), Shiva (शिव), the god of love, Durga (दुर्गा), Lakshmi (लक्ष्मी), of any other of the shaktis (शक्तिs) or female energies of the deities, and it is often glossed 'controller' in English. Literally “She who is abundant [purna] with food [anna],” the goddess Annapurna is considered a form of Durga or sometimes of Parvati, both being wives of Shiva. In her iconography she is light colored and stands on a lotus or sits on a throne. Parvati, his [Shiva's] second wife and the daughter of the Himalaya mountain, may well have been a distinct divinity in ancient times. Later, as Durga and Kali became recognized as wives of Shiva, many of the local goddesses lost some or all of their original character and began to be understood as Durga or Kali under other names. She [Durga] also takes on the role of mother in her later history. At her most important festival, Durga Puja, she is shown flanked by four deities identified as her children: Karttikeya, Ganesha, Sarasvati, and Lakshmi. ...it is possible to distinguish two different strata – one primitive and the other advanced. The primitive form of Durga is the result of syncretism of a mountain-goddess worshiped by the dwellers of the Himalaya and the Vindhyas, a goddess worshiped by the nomadic Abhira shepherd, the vegetation spirit conceived as a female, and a war-goddess. As her votaries advanced in civilization the primitive war-goddess was transformed into the personification of the all-destroying time (Kali), the vegetation spirit into the primordial energy (Adya Sakti) and the saviouress from “samsara” (cycle of rebirths) , and gradually brought into line with the Brahmanic mythology and philosophy. A 51 seconds sample of Durga Puja Mantra recited in Sanskrit. On your appeal “Protect me Durga” saves entirely. Devdutt Pattanaik: The Goddess is Maya, embodiment of all delusions. She is Shakti, personification of energy. She is Adi, primal, as ancient and boundless as the soul...The embodiment of Adi- Maya-Shakti – Durga is the invincible one. She is at once bride and warrior. The one establishes home, provides pleasure, produces children and offers food. The Goddess is Maya, embodiment of all delusions. She is Shakti, personification of energy. She is Adi, primal, as ancient and boundless as the soul...The embodiment of Adi- Maya-Shakti – Durga is the invincible one. She is at once bride and warrior. The one establishes home, provides pleasure, produces children and offers food. Devdutt Pattanaik, in Myth = Mithya (2008), Penguin Books India, 2008. p. 146-147. Among followers of the goddess Durga, who are particularly predominant in Bengal and Assam, the Durga-puja (“Worship of Durga”) is celebrated during this period... - Durga Puja. Among followers of the goddess Durga, who are particularly predominant in Bengal and Assam, the Durga-puja (“Worship of Durga”) is celebrated during this period. Special images of Durga commemorating her victory over the buffalo demon Mahishasura are worshipped daily, and on the tenth day (Dussehra), they are in jubilant procession to nearby rivers or reservoirs for immersion in water. One day my wife wished to worship Durga so that our child might be cured of his disease. For this purpose she requested me to bring a goat. When we sacrificed the goat at the temple of goddess Durga, the goat cursed me: "O sinful one, lowest of all, you wish to make my children fatherless. For this reason you will also take birth as a goat." O Madhava, when the time for my death came, I attained this body of a goat, but by the grace of Lord Govinda I can remember my previous births. The concept of Shakti is indvisibly connected with Mother worship (shakti sadhana). Generally the worship of Durga, Kali, Saraswati and other goddesses is considered Shakti worship. But the worship of Narayana, Shiva, Ganesha and other gods, too, is the worship of Shakti Herself. Whatever the means - image, symbol or yantra - the worship is only of Shakti. This is because, in the use of all these means there is a superimposition of the creation - preservation - destruction aspects of Shakti either fully or partially. So in a wider sense all worshippers are Shakti worshippers. As Parvati or Gauri, she showed her maternal and wifely emanation; as Durga, she was unapproachable; as Kali, she was terrifying and castrating. Shakti: the Mother Goddess, power or energy, originating, perhaps, in the non-Aryan culture of the Indus Valley. Mythologically Shakti is equated with the Goddesses Kali, Parvati and Durga, consorts of Shiva. The cult of Shakti flourished since the fifth century A.D. - Narasingha Prosad Sil. Mantra Upanishad: These teachings center on esoteric interpretations of specific sounds and syllables and place those interpretations into Yogic as well as Saiva, Vaishnava, and Durga theistic contexts. Typical of these works are Tarasara, Kalisantarana, and Narayana Upansihad. Nagendra Kr Singh, A. P. Mishra in: Encyclopaedia of Oriental Philosophy and Religion: Hinduism : S-Z, Global Vision Publishing House, 2005, p. 885. O Best of Brâhmanas! ... She is Nârâyanî; She is Îs’ânî; She is the S’akti of all and She is the Presiding Deity of the intelligence of S’rî Krisna. From Her have come out many other Devîs; She is Mûla Prakriti and She is Îs’varî; no failings or insufficiencies are seen in Her. She is the Tejas (of the nature of Fire) and She is of the nature of the three Gunas. Her colour is bright like the molten gold; Her lustre looks as if ten millions of Suns have simultaneously arisen. Who is the protectress, the three eyed Gauri. Varaha Purana is that in which the glory of the great Varaha is predominant, as it was revealed to Earth by Vishnu, in connection, wise Munis, with the ManAva Kalpa, and which contains twenty-four thousand verses...It is narrated by Vishnu as Muni or in the boar incarnation, to the personified Earth. Sumantu, a Muni observed :”The divine Varaha in former times expounded a Purana, for the purpose of solving the perplexity of Earth.”... Like the Linga Purana, it is a religious manual, almost wholly occupied with forms of prayer, and rules for devotional observances, addressed to Vishnu; interspersed with legendary illustrations, most of which are peculiar to itself; though some are taken from the common and ancient stock; many of them, rather incompatibly with the general scope of compilation, relate to the history of Shiva and Durga. A considerable portion of the work is devoted to descriptions. In the sectarianism of the Varaha Purana there is no leaning to the particular adoration of Krishna, nor are the Rathyatra or Janmshtami included amongst the observances enjoined. The tiger is associated with Shiva and Durga, but its cult is confined to the wilder tribes;... - Animal Worship. The tiger is associated with Shiva and Durga, but its cult is confined to the wilder tribes; in Nepal the tiger festival is known as Bagh Jatra, and the worshippers dance disguised as tigers. The Waralis worship Waghia the lord of tigers in the form of a shapeless stone. In Hanoi and Manchuria tiger-gods are also found. For centuries Durga's myth known as the Devi Mahatmya has been used to guide Her devotees through tumultuous life experiences. Durga’s myth, the Devi Mahatmya dates back to the fifth century CE. Today different episodes from the myth are recited on each day of Her autumn and spring festivals that take place around the equinoxes each year. Durga is Goddess invincible to patriarchal constructs and control. She is the amazon, the “no-husband” one” as defined by Vicki Noble, who may choose to have lovers or consorts but is not possessed by them. Nor does She lose herself and her desires to them. She is the virgin in the original sense: whole unto herself regardless of whether or not She chooses a lover. Durga and her entourages carry a vast legacy of empowered leaders, healers, and artists. They offer multiple models female existence. In order to understand the essence of Durga and all that She offers, we must understand the principles, practices and ideologies of the Tantric tradition. Durga stares them down, unfazed. They mistake Her composure for fear. Their egos swell and pride overcomes them as they get lost in visions of the grandeur that awaits them once they conquer this Goddess. However, they are forgetting who She is. As Mahamaya (Great Illusion), the all powerful Goddess outwits the demons by influencing their minds to think they can overcome the Divine. She immediately knows through her Omniscience, that these demons are clouded by ignorance. As they advance towards Her She lets out a sigh, which is the mantra Hum. Her earlier epithet Vac, Saraswati is the power of sound, a power which can create and destroy. As Her divine utterance reverberates across the cosmos, She points her finger at them and the demons are destroyed. The Sapta and Asta Matrkas (seven and eight Mother Goddesses) are aspects of the Great Goddess Durga and come to Her aid in the battle against the demons. They are feared and respected for their elemental natures and life-giving and death-wielding powers. Therefore, many village rituals, particularly during the Durga Puja, emulate this relationship between the nine lunar months of pregnancy and the nine-month agricultural and monsoonal cycles. One of the most important festivals in North India is Durga Puja, which is celebrated in the autumn during the month of Asvin. The festival takes place over a period of nine days and is often called the Navaratra festival. The central image of the festival shows Durga slaying Mahisha. Navaratra and Dasara, probably were often understood to be one continuous festival in which the worship of Durga and the hope of military success were inseparably linked. Although the military overtones of Durga Puja are apparent, other themes are also important during this great festival, and other facets of Durga’s character are brought out by the festival. Such important goddesses as Parvati, Durga, Kali, Radha, and Sita are unknown in early Vedic literature. Sri, though she appears in later Vedic literature, is not fully developed and does not occupy the central role that she does in the later tradition. One of the most impressive and formidable goddesses of the Hindu pantheon — and one of the most popular — is the goddess Durga. Her primary mythological function is to combat demons who threaten the stability of the cosmos. 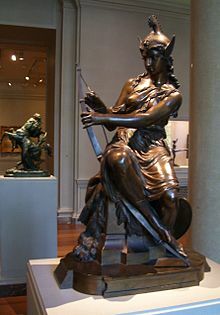 In this role she is depicted as great battle queen with many arms, each of which yields a weapon. She rides a fierce lion and is described as irresistible in battle. The demon she is most famous for defeating in Mahisha, the buffalo demon. Around the fourth century AD images of Durga slaying a buffalo begin to become common throughout India. By the medieval period (after the sixth century) Durga has become a well-known and popularly worshiped deity. Her mythological deeds come to be told in many texts, and descriptions of and injunctions to undertake her autumnal worship are common in several late Upanishads. Although Durga becomes an establishment goddess in medieval Hinduism, protecting the cosmos from the threat of demons and guarding dharma like a female version of Vishnu, her roots seem to be among the tribal and peasant cultures of India, which eventually leavened the male dominated Vedic pantheon with several goddesses associated with power, blood and battle. In the Devi-mahatmya Durga is also described as quaffing wine during battle in her fight with Mahisa and as laughing and glaring with reddened eyes under its influence. In the concluding scene of the Devi-mahatmya her devotees are instructed to propitiate her with offerings of their own flesh and blood. Although the worship of a goddess is not always part of Dasara celebrations, there are many indications in ritual and mythological texts that the annual (usually autumnal) worship of a warrior goddess, often specified to be Durga, was part of festivals associated with military success. Durga, then, in the form of the pot, is invoked both as the power promoting the growth of the agricultural grains and as the source of the power of life with which the gods achieved immortality. In the forms of the navapattrika and the ghata (pot) Durga reveals a dimension of herself that primarily has to do with the fertility of the crops and vegetation and with the power that underlies life in general. In addition to granting freedom from troubles and bestowing wealth on those who perform her puja, Durga is also affirmed to grant agricultural produce, and at one point in the festival she is addressed as she who appeases the hunger of the world. It is a typical ceremonial scenario [blood sacrifice] in many cultures, and it seems likely that at one time it was important in the celebration of Durga Puja. Kali, Tara, and sometimes Durga are the main forms of the goddess in this tradition [non-scriptural], and there are ten different forms of Kali that are worshiped (the ten Mahavidyas or great wisdom figures). The yantra of Nava-Durga (Durga surrounded by nine shaktis) hung by a thread around the arm or neck prevents diseases, whereas a yantra of Lakshmi brings fame and wealth, and keeps away danger and anxiety. Accompanied by these goddesses, she conquers the demon army (which is exclusively male). The story of Durga in the Devi Mahatmya revolves around three battles: Durga fought with Madhu and Kaitabha, with Mahishasura and his armies. A composite form of the female energies emerged as Mata or w:DevIDevi....When she enetered the puranic pantheon the virgin Earth Mother become Durga and, changing with provenance and tribe, her names andanthropomorphic forms are legion. In Bengal, again, the worship of Durga is accompanied by wearisome puerilities and gross idolatry. The cult of Kalı Devı is also associated with the horrors of Thagi. The major Bengali Hindu goddesses—Kali, Durga, Tara, Lakshmi, Saraswati— are generally shown as young and attractive. Even Kali, whose images in other regions of India are emaciated and ugly, is frequently shown as beautiful. The goddess Kundalini is sometimes portrayed in the form of Durga, as a beautiful woman who rides a lion, as a symbol ofstrength, courage, and virtue. When kundalini energy is aroused in a person, the goddess rides the lion of yoga. There are homa fire sacrifices twice a day, with vegetables and milkproducts, and large yearly pujas for Durga and Kali, with high attendance. There are offerings of bananas, vermilion, rice, and sweets, and on Durga Puja there isimmolation. Durga is a goddess with several important aspects: the folk dimension offertility and threat, a military and royal aspect, a Sanskritic side, and an ethical dimension. There are many types of devotion associated with Durga. In her modern and urban aspect, Durga is the Goddess of courage annstrength, who remained pure when tempted by demons and was able to conquer them resorting to the power and dominion of the Hindu gods. Ambika/Durga responded that she could only marry the man who conquered her in battle. The demon kings sent their armies, which she conquered, and then sent Chanda and Munda. When Durga saw them, her skin became black with anger, and Kali emerged from her forehead. Kali devoured elephants and riders, ate weapons and killed Chanda and Munda (Durga then gave her the name Chamunda, as conqueror of Chanda and Munda). The demon kings and their remaining armies came out and surrounded Durga. At that moment, the creative energies (Shaktis) of the various gods came forth in female form, as an army to fight the demons. When drops of blood from the demon Raktabija fell to earth and created new demons, Kali drank all of the blood so that no new demons would arise, and Raktabija was conquered. When Shumba accused Durga of being dependent on her female army to win the battle, she absorbed them back into herself, saying that they were only her own powers. Both demons kings were slain in the battle. When Ravana kidnapped Sita (who was one of the incarnations of the goddess), Durga became angry with him, and she shifted her loyalties toward Rama. When Rama and his armies came to rescue Sita, Rama was terrified, and Brahma suggested that he would worship the goddess who would give him courage. Durga Puja also involves home worship, in which wealthier houses can afford their own statues, and Durga is welcomed in a more personal manner as the daughter of the household who has come for a visit. Because a daughter would often leave have her natal family at a very early age in an arranged marriage in which she went to live with her husband’s family there was a great sense of loss on the part of both the daughter and the parents. Durga Puja represents the time that the daughter could return to her parent’s house and was a time for happiness and reunion. Families welcome their own married daughters by honouring and worshipping Durga. When Durga (and daughter] leave, at the end of the festival, the married women of the family or neighbourhood typically gather in the household and walk around the goddess in a circle making the noise of ululation (a thrilling sound of farewell), and then wipe of the goddess’s tears with betel leaves (she cries because she is leaving her loving household). She is offered consecrated food and red kumkum powder, symbolizing her return to married life. ...In 1639, Kantirava Narasimharaja made the transition from local hill goddess to Puranic deity by referring to the protector Godess of the Mysore kingdom as both Chamundi and as the slayer of the buffalo demon (Mahishasuramardhini), clearly associating Mysore and the myth of Durga slaying the bufflow-demon Mahishasura. There are well-known goddesses such as Durga and Kali who are richly endowed in many brahmanic temples and have acquired a plethora of textual references, yet these goddesses still carry with them explicittribal associations. Over many centuries Durga and Kali were transformed dramatically as they were successively associated with devotes of tribal, agricultural, warrior, priestly and modern urban orientations. A wife who is dedicated to her husband is often referred to as Sita, or a woman who exhibits a fighting spirit to make things right is referred to asKali or Durga. Feminist movements have started to use this traditional understanding to empower women. Durga is a very old divinity known in prototype as Vac, the goddessof victory. Suggestive references can also be found to a similar goddess onIndus valley seals, and even among early Mesopotamian artifacts. There are also strong hints of a “Durga-like” presence in early Indus Valley settlements. The first known sculpture of Durga asMahishasuramardhini in Indian art dates from the first century BC. The same female power is also mentioned in the early Sangam literature from Tamilnadu, where she is named Kirravai. Again in these ancient sources, she is portrayed as the goddess who kills the buffalo demon Mahisaura. Durga is also very prominent in the famous stone carvings at w:MahabalipuramMahabalipuram, in Tamilnadu, where several sculpted representations of her appear. She has obviously been well integrated into the official iconographic traditions of South India by the mid-seventh century. In 1639, Kantirava Narasimharaja made the transition from local hill goddess to Puranic deity by referring to the protector Godess of the Mysore kingdom as both Chamundi and as the slayer of the buffalo demon (Mahishasuramardhini), clearly associating Mysore and the myth of Durga slaying the bufflow-demon Mahishasura. As such he also explicitly reconfigured his realm with the Puranic landscape. The hill was no longer just important to the inhabitants of Mysore, but it acquired pan-Indian significance, and its influence reached farther. It is at this point that the goddess of the hill was clearly associated with Chamunda and Durga and with the Puranic narrative of Mahadevi, signaling a period of greater imperial aspirations. This page was last edited on 12 December 2018, at 12:53.